It may have come out in time to lord it over the charts during the Second Summer of Love; it may have a production credit for Coldcut – but there’s nothing outrageously radical about “The Only Way Is Up”. It’s the fifth cover version to get to number one in 1988, and nobody who’d heard “Don’t Leave Me This Way” then this would feel the ground of pop had shifted dramatically. If there’s something new here it’s in the record’s self-assurance, the way it acts like that ground has indeed moved. Even that might be a trick of hindsight – The Communards sound to me more subcultural than they were, because the hi-NRG music they’re drawing from never broke as big as house. Whereas Yazz And The Plastic Population are working within what has turned out to be the basic grammar of dance-pop for most of the next two decades: uplifting lyric, house rhythm, big diva voice up front. So from the moment “Only Way” announces itself – with that glorious express train horn sample – it makes everything else sound like it’s trying too hard. Don’t worry about that stuff, it says, this is what pop music sounds like now – and it’s only going to get better. 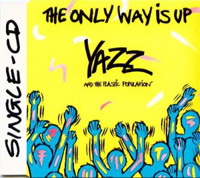 This effortless quality meant I soon felt “The Only Way Is Up” had been around forever, and people talked up Yazz as a natural star. Ever since it’s been a record I take for granted rather – I never had to work at liking it and perhaps for that reason I never loved it. This despite its excellent qualities – Yazz herself is a good deal more subtle than a lot of the house divas to come, and her warm, chuckling performance helps the song evolve from one about hope in the middle of desperate poverty to a more generalised having-it-large deal. (You could take this as a criticism, I admit, but Coldcut and Yazz are pragmatists: that chorus is too enormous simply to use on social concern!) What I like most is also what dates the record most: the bustle of the production, that excitable rhythm-and-sample chatter from S’Express still bubbling away under the more structured song. The great thing is that when first I heard this on the radio it sounded like a bootleg, whereas “DLMTW” has all the life produced out of it. Is “Doctorin’ The House” the only top five hit to feature the (sampled) voice of Simon Bates (“THE MUSIC MAKER”)? Surely not, Marcello, as the (actual) voice of Simon Bates is buried deep in the mix of the Ferry Aid record! PS. is this the first Popular No1 record cover to be from the CD single? Which reminds me – we bought our first CD player in the summer of 88, and I bought my first two CD singles: EBTG’s cover of I Don’t Want To Talk About It, and Leonard Cohen’s First We Take Manhattan. But I wouldn’t make the full switch to CD singles for another four years. Number 2 Watch: More SAW: A whole four weeks of Kylie Minogue’s The Locomotion – I knew that *that* was a cover version! – and then two weeks of Brother Beyond’s ‘The Harder I Try’. I’m pretty sure I’ve never once listened to this song of my own accord but I do quite like it – this is mainly down to the fond memories I have of it being played at childhhod birthday parties alongside Belinda Carlisle and the entire SAW catalogue. I also think that the big, booming, mid/late-’80s production is really effective – it’s not a style I’m normally a fan of but it occasionally works brilliantly in Hi-NRG pop (‘Always On My Mind’ is probably the best example). A 7/10 seems about right. Hm. I know that its good, I knew so at the time, but its so overfamiliar as to hold few surprises for me. Like ‘Perfect’ a few entries ago, it has a chorus that’s easily extractable for TV clips and I find it hard to reconnect with its original pop single context. “The Harder I Try”: the closest the Isley Brothers ever came to a UK number two hit (it samples the drum intro from “This Old Heart Of Mine”). Follow-up “He Ain’t No Competition” very underrated; the sitar FX make it sound like SAW are tackling the theme to Sir Prancealot (one for the teenagers there). FUN FACT: According to my mate Nick’s new book 101 Forgotten Pop Hits of the 1980s, the first chapter of which is dedicated to “The Harder I Try”, Pete Waterman described “He Ain’t No Competition” as their “message to Matt Goss”. FUN FACT (2): Yazz ended up marrying the head of her record label. His name was Jazz. Too cute! I should also mention the very servicable Bam Bam remix of TOWIU, which came out as a separate 12″ a few weeks later and extended the track’s dancefloor life for a couple more weeks. As for the fabled Summer Of Love, the full force of the revolution rather passed us by in Nottingham, but a few acid tracks worked well at my club nights: Mr Lee’s “Pump Up London” (complete with Nottingham name check), Baby Ford’s one-sided “Oochy Koochy (F.U. Baby Yeh Yeh), Jolly Roger’s “Acid Man” and Dave Dorrell’s Afro Acid mix of Mory Kante’s “Ye Ke Ye Ke”. We had just moved our night to a bigger club, and had upgraded from fortnightly to weekly events, with a good core crowd of regulars. And oh joy, the new club had a SMOKE MACHINE and a STROBE… except that it was a rather shonky strobe, which you had to switch off for about half an hour between uses. The sound of the summer holidays twixt middle and high school, love the pseudo-acieeed bass squelches and popping percussion track. Funnily enough, I had known this was a cover at the time, unlike many others, but for years I had it in my head that it was by Otis Redding, not Clay. I was no doubt misled by Bruno Brookes or one of his ilk. I get the feeling that if Coldcut had carried on in this vein (also evidenced by the marvellous ‘People Hold On’) then the post acid-house pop landscape would have looked quite different. As it is, the Beatmasters produced the follow up, ‘Stand Up For Your Love Rights’ which now sounds a lot better than I remember it. 28 July 1988. Also in the studio that week were; Shakin’ Stevens and Siouxsie & The Banshees. Gary Davies & Nicky Campbell were the hosts. 18 August 1988. Also in the studio that week were; Aztec Camera, Chris Rea, Fairground Attraction and Julio Iglesias. Mike Read & Simon Mayo were the hosts. Have to disagree with the majority here.. disliked this intensely then and still do. The train horn is the first irritation and it speeds downhill quickly after that. Every sound on the record irks but mostly it’s Yazz’s over-reaching, souless voice combined with the obvious easy sentimentality of the lyric which sink the whole affair for me. It does sound exactly like a SAW abomination and is all the worse for it. It gets a 1 just because it isn’t. Now ..where’s my Fields of the Nephilim 12″ ? Aside from that I really didn’t think it amounted to much then, and I haven’t changed my mind now – it does sound rather sub-SAW to me (was the train-horn supposed to be “wacky”?) – not my thing at all. …and did no-one else just think that Yazz was just a bit, well, scary? #49: How do you know it’s “souless”? I’m being hard on this because I happen to know at least some of the backstory behind this record – which is one of several reasons why I haven’t posted at length about it here, and even on what I’ve written privately I’ve been careful not to name names; it’s not really anybody’s business but nevertheless I do know some of the things which provoked it and what it represented to the people who made it – and really if we can’t move beyond the trope of “soul” (whatever that word was ever supposed to mean, other than a convenient musical genre label; see Phyl Garland’s The Sound Of Soul for a full explanation of how and why “soul music” came about) then we’re not going to get anywhere. Maybe you think that cheery Yazz doesn’t communicate the thinking behind the song or the record adequately enough, to which I would suggest that worthiness and needless melisma would have dragged the record down to a level where we wouldn’t be discussing it here (and likewise the Otis Clay original does not go down that route). Also, what’s wrong with “obvious easy sentimentality”? Don’t you think that the words would resonate with and touch listeners in that kind of situation? On a personal level, I can assure you that in at least three cases it did, and maybe still does. Do you want every pop song to come across like Geoffrey Hill wrote the lyrics? That would be a dry, barren life for sure (no offence to GH – I voted for him – but you can’t just have that). #51 In this instance I would describe ‘souless’ as lacking the ability to convey emotion/feeling/warmth through her voice. Of course to another listener it may just do that but I can only judge what I hear. There may well be good intentions at heart but, to me, it hasn’t translated through the record. I have no problem with positivity in pop but I don’t don’t like the way it gets there and there’s little of interest to me here …and certainly the production including the parping makes me like it even less. #50 Yes she also scared the pants off me. Supposedly written about the experience of squatting. The production is a tad thin in places, but Yazz’s soaring vocal more than makes up for it. Despite this, it’s always been a record I’ve liked rather than loved. 7 is about right. Something that doesn’t seem to have been mentioned in the thread above is that the first Yazz album (which included TOWIU) was produced by Rob Gordon of Sheffield’s FON studios, soon to be founder of Warp records. So we’re sitting at the fulcrum of Ninja Tune (founded by Coldcut) and Warp here, not SAW. Revisiting this song lately has been like a hit of epiphany. While never disliking it, I’d honestly never cared for it all, despite the fact that – being a sugary acid house crossover hit – it seemed custom designed for my tastes. And then after reading this thread a month back I revisited it for the first time in years and the squelchy 303 bass sounds in the verses absolutely jumped out at me, rubbing up against those brass hits where applicable and the Big joyous spirit of the whole track and it was like love at first sight (listen). The whole thing sounds absolutely wonderful to me now, so thanks for providing me one of my favourite pop moments of 2017.